Community and corporate leaders today cut the ribbon at a site that’s a joint effort between the Roanoke Outside Foundation, The Bridges development, Carilion Clinic and the City of Roanoke. The launch will be managed by Roanoke City Parks and Recreation and the city’s storm water division. “This project, funded by private donations – no tax dollars – demonstrates our community’s support of investment in infrastructure that enhances our outdoor assets,” said Pete Eshelman, director of outdoor branding for the Roanoke Regional Partnership and Roanoke Outside Foundation. There is no cost to use the launch, located on the back end of a parking lot off Reserve Avenue near the intersection of South Jefferson Street and next to HoneyTree Early Learning Center. It’s halfway between Wasena Park and Piedmont Park, making it easier to canoe, kayak, or tube close to the region’s urban core along the Roanoke River Blueway, a water trail that runs from the South Fork of the Roanoke River at East Montgomery County Park to Hardy Road in Bedford County. Amenities onsite include a viewing platform, steps down to the river, boat storage rack and informational kiosk that includes a map of the river. The Roanoke River Blueway (www.roanokeriverblueway.org) has been named one of the Virginia Treasures, an initiative by Gov. Terry McAuliffe designed “to preserve, protect and highlight Virginia’s most important ecological, cultural, scenic and recreational assets as well as its special lands.” The program’s goal is to designate 1,000 treasures across the Commonwealth. 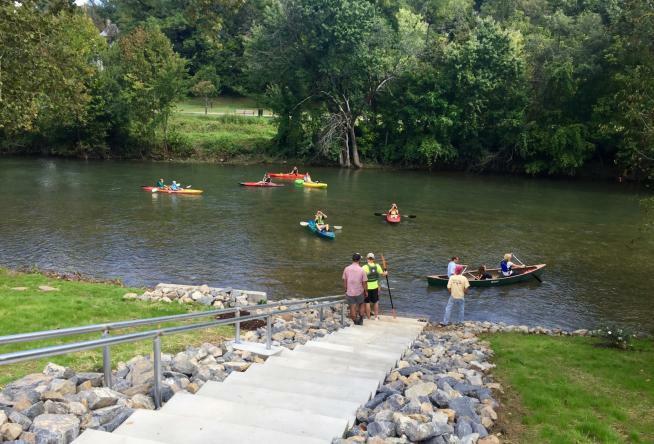 The Roanoke River Blueway Committee is managed by the Roanoke Valley-Alleghany Regional Commission and works with member localities to promote recreational use of the Roanoke River. The first takeout location point downstream is the 13th Street Bridge. The Tinker Creek access point in Vinton is the next developed access point. Construction costs were donated by E.C. Pace & Co. Balzer & Associates, Boxley Materials, ProCon, Ferguson, Home Depot, MB Contractors, Rockydale Quarries and Valley Landscaping. Financial support for the project came from dozens of businesses and individuals, including Carilion Clinic, UBS Financial Services, Adams Construction and Backcountry.com. Many individuals contributed to the project, which is in memory of Joe Gwaltney, former vice president of Boxley Materials, and Steve Buschor, former director of Roanoke Parks and Recreation.